Pasta is made fresh daily at Flour Eggs Water. Being spoilt for choice is the ultimate measure of success for parents looking to please everyone in the family without having to dash here, there and everywhere. The vintage tram takes pride of place in the revitalised space. While the temptation for the kids will be to head straight to dessert, you can distract them sufficiently by doing a walk through the Tramsheds building itself, taking in the fascinating historic elements. The last tram rolled out of the depot in 1958, and as the decades passed the building fell into disrepair; evidence of its interim life as a haven for street artists can be seen all around you. When the building and restoration work began in 2015, parts of the colourful graffiti were retained on the exposed brick walls. Follow the improvised art past the different restaurants until you end up at the Tram R1 1995, and then head outside to see the markings that show how the trams would have approached the wide entrance. Dust’s bread, and other menu items, is made from flour stone milled on-site. If you arrive early, there are a host of hot spots to grab breakfast: fill up on farm-fresh eggs and bacon at Butcher and the Farmer (inside the tram, of course) or opt for a bacon and egg roll with house ‘HP’ sauce at Garçon accompanied by a robust house blend coffee. At artisan bakery and pizzeria Dust there are myriad breads on the menu that can be toasted up and served with Pepe Saya cultured butter, or for something a little more exotic, Middle Eastern diner Bekya also does breakfast on weekends. With breakfast out of the way and energy to burn, now’s the time to make the most of the ample open spaces close by, including the delightful Jubilee Oval and Park, with its cute Cricket Pavilion, built in 1910, and a picturesque waterfront walk that will help build up your appetite before heading back to Tramsheds for lunch. When it’s time to eat again, head to Dust, where owner Cesare Salemi stone mills grains, sourced from local farmers, on-site to use in its breakfast, lunch and dinner menu. The show-stoppers are the handcrafted wood-fired pizzas, including a luxe version of a ham and pineapple, which constitutes a slice of heaven to most kids. Flour Eggs Water is perfect for the family lunch, with communal tables under a mish-mash of seriously stylish lighting. 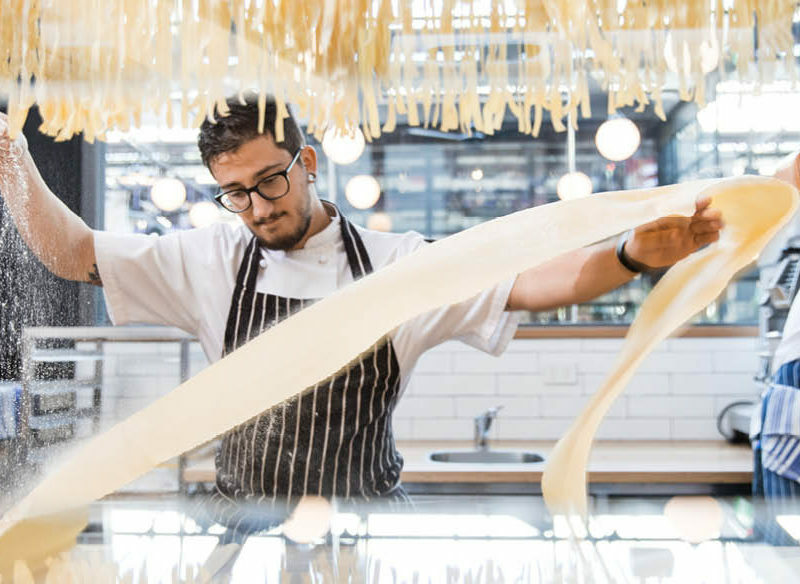 Pasta is another family staple; Flour Eggs Water by A Tavola, with its communal tables under a mish-mash of seriously stylish lighting is another perfect option for a family lunch, utilising the simplest of ingredients to produce flavoursome dishes. 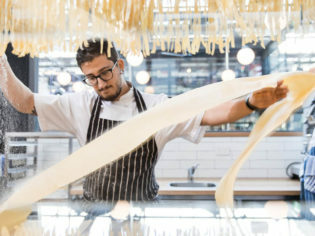 It even comes with a floor show to mesmerise its diminutive diners: all the pasta served is made fresh daily in the open kitchen by a skilled pastaio, under the watch of head chef Euan McGowan. Across the way, Fish & Co. has transplanted from Annandale to a fun space, where its owners haven’t missed a beat in serving up tasty fish and chips that are faultless when it comes to their source: Belinda and Sajad take huge pride in presenting a menu made up of responsible, sustainable fish species. Enjoy sustainable-caught seafood at Fish & Co. The much anticipated last stop of the day needs to be at Messina, the fantastical ice-cream emporium with flavours of wit and whimsy (Apple Pie, anyone?). If there’s only room left now for a piccolo scoop, opt for a take-away, the ultimate family souvenir of a day at Tramsheds. This feature was created by Australian Traveller and supported by Tramsheds Harold Park.